//One of Spyderco's top selling knives for the last few decades. 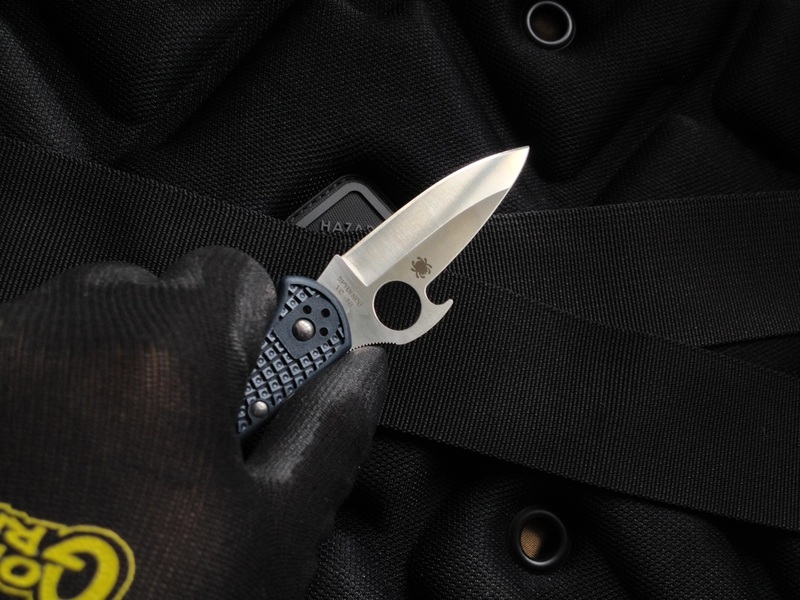 The wave Endura and Delica are convenient to carry, low profile knives that utilize the Emerson wave feature/patent which makes deploying the knife require one less motion & is faster than an automatic knife. In many ways a possibly better tactical knife than even an Emerson because the knives have multiple pocket clip positions for right or left handed individuals & the Seki City, Japan construction means the finest quality hardware & blade steel. //The blade is a hollow grind VG10 which means the edge will be easy to maintain for quite some time by just stropping. Hollow grind means the cutting edge will not widen as you sharpen it so for decades to come the knife will perform the same as it did brand new. The second advantage is a hollow grind allows for more different angles of entry when cutting through materials. The handles are little slick around the profile but the actual sides have very good grip with the patented bi-directional volcano texture/pattern. //Inside the handle are steel liners. They're encased by the fiber reinforced nylon handles which makes for more structural rigidity. 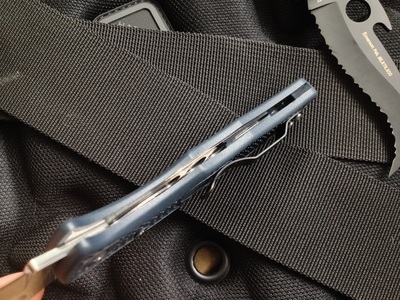 In essence you have you typical liner lock folder but in a more comfortable/stronger package. Older generation Enduras had issues in terms of locking up securely and this fact is something buyers need to take into consideration. The newer models are refined but still the back lock is not the strongest type but it is in many ways more suited for tactical knives because your hand can grip apply pressure on the lock but not possibly unlock it. Ultimately all folders except for Cold Steels can unlock but an important design feature that was pioneered by Spyderco is the inclusion of a safety choil/ricasso. //As a utility knife the Delica works as the better of the two because of the blade thickness. Being a hollow sabre grind the knife can get wedged into what it's trying to separate at some point and then with a strong push the knife will quickly cut through and that is a dangerous motion. But for self defense both knives are efficient. The main draw to the Endura aside from the added length is the extra weight the blade carries. This additional weight means the knife can be shaken open using gravity and momentum. 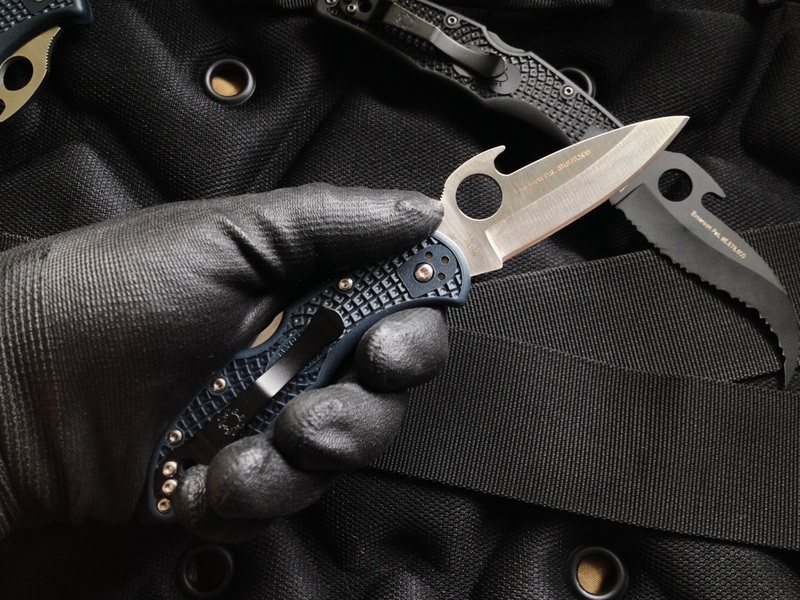 The Delica requires someone use their thumb and in many possible situations that can be a hindrance. //For me the Delica's profile and shape make it my favorite in terms of collectability and feel. It is smaller so & the shorter blade makes manipulating the tip & the direction the edge is facing feel natural and fast. The spear shaped tip on both the models is definitely tactical and also useful for utility. Where the Delica fails and the Endura surpasses it is in the deployment. The Endura has a heavier blade so can be shaken open as a third optional deployment method. This is a crucial method for any folding knife because it does not require fine motor skills in a confrontation. There are many articles and scientific proof that in an intense situation, adrenaline affects the body's ability to do small motor skills like putting the thumb in a hole or pushing a button. 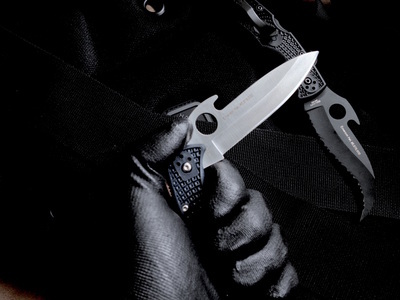 The Endura is one of the top folding tactical knives in the industry & is a favorite of many people. The best feature of the design is the blade tip being in line with the handle so that manipulating the tip feels natural and fast. This combined with the slight negative angle of the blade makes stabbing/slashing motions exceptionally easy & require less movement of the hand and wrist to position/aim. Overall this is a strong contender for best tactical folder but the negative forces on the back lock during stabbing motions makes the [Spyderco Matriarch 2] the more well formed design. Even so, if the user is aware of this, is confident in the safety choil, & trains the proper technique, there's enough design here to make a very effective self defense weapon. Highly recommended after first hand experience.